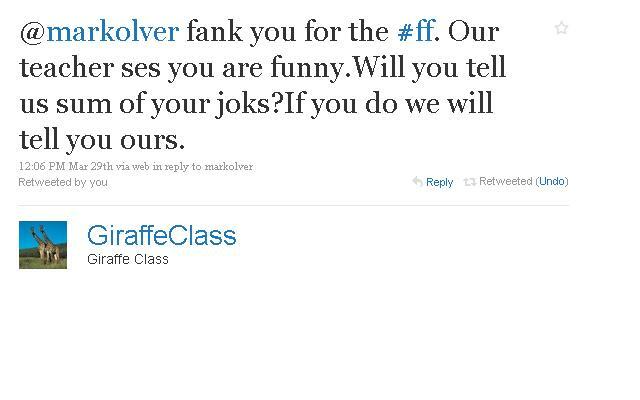 At the end of the Spring term in 2010 the Giraffe class were due to cover riddles for the last week (which was only four days long as it finished with Good Friday. This was part of a whole Key Stage plan to cover riddles in the run up to KS1 SATs. The teacher was trying to find a way to make the week as engaging as possible for the children as well as tieing it into the ongoing work of trying to further develop the attitudes of children towards writing. The planning was built around a request sent out on Twitter on the Sunday morning for riddles by the teacher which were kindly supplied by a range of teachers in her PLN. This included the kind offer of a Smartboard file full of riddles from Matt Lovegrove which added to the texts for the shared reading work. On the Monday morning the children read the riddles sent to through twitter and submitted their answers back to the teachers. This slide share shows the riddles they solved. At the same time the teacher showed the children that they had been the subject of a Follow Friday tweet by the comedian Mark Olver. She explained that he was recommending people to read their tweets and that they should thank him for it. She also explained that he was a comedian and that this meant that he told jokes for a living. This led to this tweet and the challenge to share jokes. 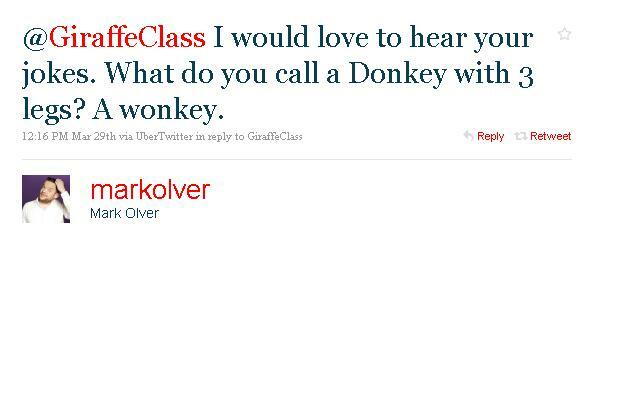 Mark Olver almost immediately replied to the class with a joke which made the children laugh. There was huge excitement caused by this tweet and the children wanted to share their jokes with Mark and their other followers. The teacher made the decision to encourage children to tell and share jokes. This fits in with the emphasis on developing speaking and listening that has been placed during the year. On the Monday the children sent three tweets out with jokes during the continuous provision in the afternoon. This is part of a shift which has taken place in the last term where the children have been given greater independence in their tweeting. They still have to receive permission to send the tweet – this is part of the shift towards developing their greater independence in communicating in line with the school’s e-safety approach. The children became extremely excited about the joke telling and it became very clear that this would be a more fertile approach than the riddles. The children started crowding the writing table to write their own jokes to put into Twitter – if you look back at the original blog post about the class this was a group in September which included a significant proportion of reluctant writers. At one stage on this day more than half the children were writing jokes. The teacher introduced the rule that it had to make her laugh to be tweeted – hence the joke about the squirrel getting through! The slideshare shows the development of the tweets and the huge role played in this by other Tweeps who sent jokes in and the continuing support of Mark Olver who replied to jokes sent through. You will also see in the slideshare that the children continued to tweet about other areas of their work including twitpics of their Easter Baskets. They then recorded their jokes using Easi-Speaks and recorded them using audioboo. This was a new application for both the teacher and the children and was highly significant. The children rehearsed their jokes and then recorded them. You will hear that in early boos the children spoke in silence and that by the end they decided that it was important that there was laughter at the end. To an adult it sounds almost like canned laughter! So by the end of the four days the use of Twitter had created a real buzz in the class and finished the term off with a bang. The teacher cited numerous examples of comments from children about the work and how they had learned jokes at home to try on their friends at school. In addition, they had enjoyed the fact that the planning had gone with their interests as the teacher had moved to jokes on the Tuesday. The children worked in groups trying to work out why certain jokes were funny and how they worked. The teacher gave them time to work on jokes but also led guided sessions where children read and discussed jokes. Personally as a literacy adviser I find the link between understanding of jokes and ability in writing fascinating – there is some research into this. So the end of the second term of tweeting has seen the children continue to make very pleasing progress in their writing and are predominantly on or ahead of track. This is obviously not exclusively due to the use of Twitter which is just one of the approaches, materials and strategies used by the teacher to create a vibrant writing environment. Great use of a range of technologies. Thanks John – it is really inspirational particularly as the teacher is someone who has never used any Web 2.0 before and is in a school which doesn’t appear to be using ICT to develop children as web 2.0 users and producers. For me the beauty of this is that the teacher believes that her technology use and understanding is no further ahead than the children’s. She is determined to give the children the freedom in using the applications and become increasingly independent. This means that they are driving the technology and see it as absolutely natural. There are implications for other teachers in the school though as these children will expect to be producersin every year. AudioBoo, Twitter, Easispeaks – what a fantastic array of tech in one class. Brilliant. It just makes me want to do the same with my own class, after I draft up a permission letter to allow children to use Twitter! That’s what I love about this post. The class used not only hardware but online tools that engaged and created an effective learning environment. A fantastic example of how Twitter and audio can be put to intelligent and rewarding use. It really is fantastic how the class have taken to it and how the developing independence in use of the children has allowed the teacher to start developing wider use of Twitter to include the twitpics and audioboos. For me it has been fascinating following their work for the year and how they have developed a sustainable approach to the use of web 2.0.